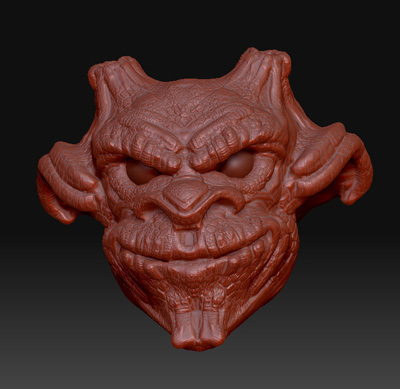 It’s bothers me that I can sculpt pretty well but can’t draw worth a crap. Here’s another illustration Jason and I we worked on for Columbia. 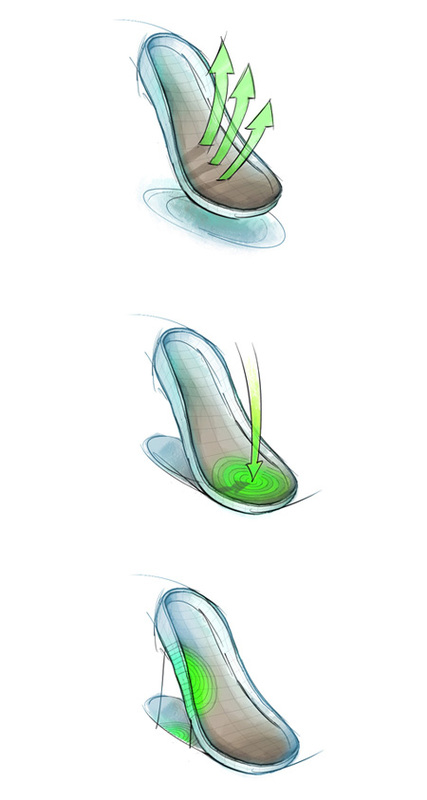 Jason sketched some initial concepts and I helped realize the idea by building these mini 3d environments which show each tread type that is used on Columbia footwear. Renderings were done in c4d using AR3. My office mate Jason just showed me this illustration we worked on last year for Columbia. They’ve started using it in their catalogs. Not online as of yet. 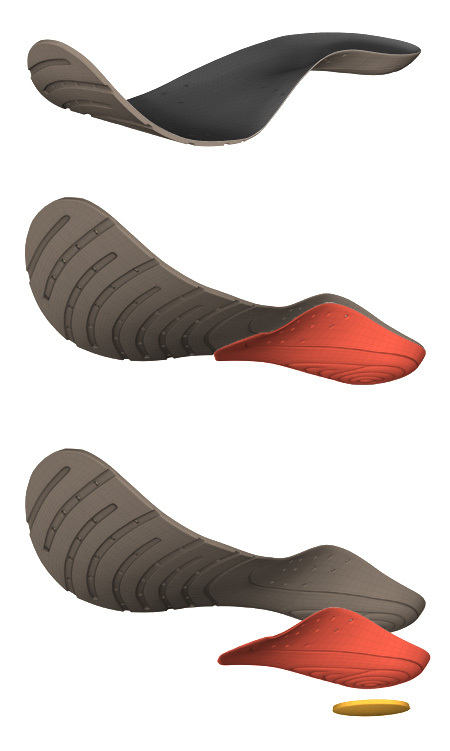 Jason produced sketches at inception, and I modeled and rendered this crazy complex insole. Holes, grooves. Insane! Renderings created in c4d using AR3. 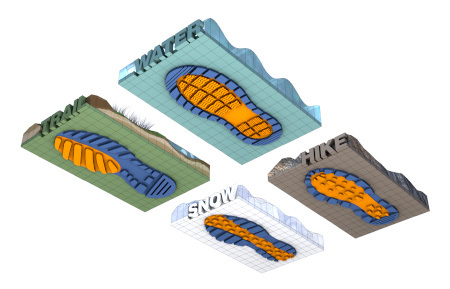 Above are 3 fabric technology illustrations done for Columbia Sportswear. Omni-Shade, Omni-Tech, and Blood-n-Gutts. Jason Laramie created some preliminary sketches for these and I built the rest in 3d. I later animated these 3 fabrics using realflow for the rain and the stain. 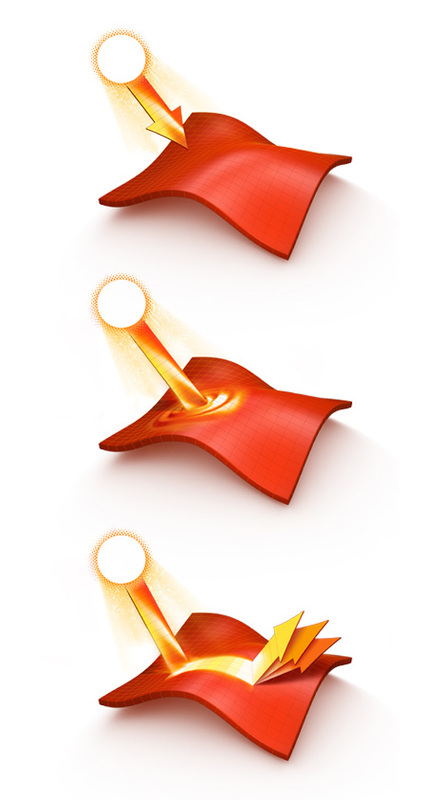 These were rendered in c4d’s AR3, with GI, and then composited in Photoshop as well as Aftereffects. A couple retail renderings for Big Giant. Almost done with the 2008 chicago marathon space that they built out last year. They didn’t come away with good photos, so I will be rendering the space in 3d. Also need to work on a smaller rendering for BG. This is the second largest retail space I believe I have ever worked on, aside from the Nike Factory store. The amount of product in this scene is pushing my computers to their limits. Vray Proxy objects being used at will! My goal is to use a lot of this product (which was ported over from c4d renderer), and I will be going back and re-rendering a lot of my old work in Vray. Also working on a 3d illustration for BSSP in SF. On the back burner are a few Nike projects as well, that I probably won’t get to till the end of the month. Lastly some wine bottles for Dot Zero. Will post some images as soon as I have them done. 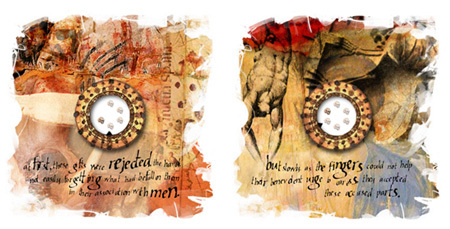 Second set of illustrations for Columbia commissioned through BSSP. These are the sketches which were signed off on. Finals on this are just about done. Possibly getting approval tomorrow. Here are the finals for Columbia created for BSSP. Hopefully will be seeing these in advertisements going forward. 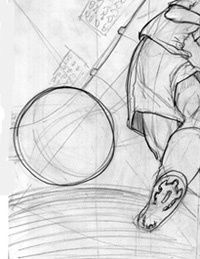 Ok, here are the 3 final sketches for first half of illustrations for Columbia, as commissioned through BSSP. Next post will be the finals. Check here for more information on what Omni-Shade does. Pretty cool fabric technology. Got a call the other day from an ex-Character SF employee who now works at BSSP (Columbia’s agency of record also located in SF). I was introduced to BSSP a couple months ago, as they asked me to resize some animation assets I created for Columbia. Now my old contact from Character works there as an Art Buyer. Somehow she found out I had done these Columbia illustrations and animations, and asked if I was interested in making some new one’s. Yes please. Small world eh? Will post some images when I can. 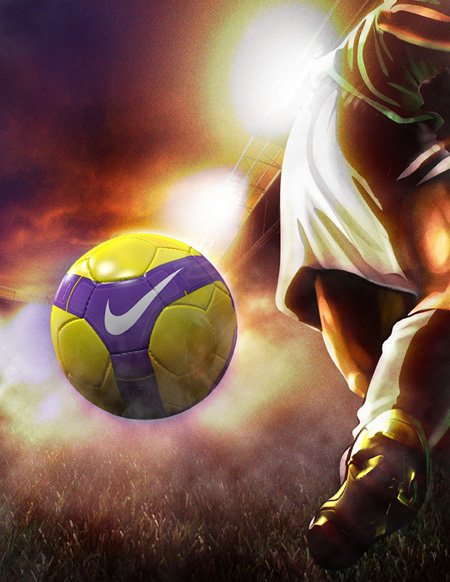 I was commissioned by Nike to create some soccer illustrations recently. This was a fun project. Part illustration, part 3d, part design. 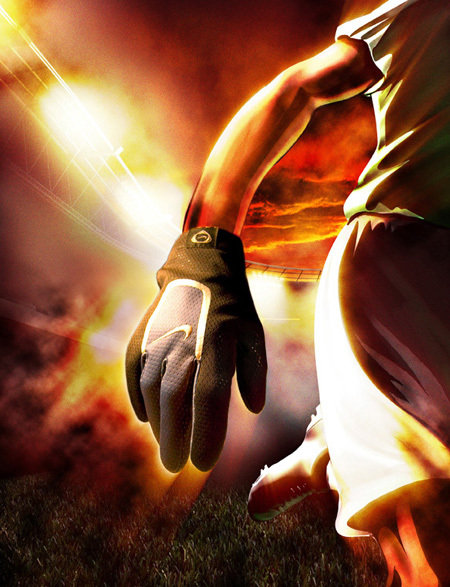 The goal of the illustration was to show a somewhat moody image of a ball and a glove (2 separate images) within a stadium environment. The Inspiration I was given was a very dark night shot of a field (no stadium) with a floating soccer cleat, and a lot of photoshop work. It wasn’t a bad illustration per-se, but it wasn’t what I would call good. My first thought is we needed some type of human form. A ball or glove sitting in the middle of a stadium is a bit odd to me. I thought the product needed a little more context. I mentioned this to Nike, and their worry was that the product would get lost if there were soccer players on the field, so my next step was to prove the concept with a sketch. We decided that the mood Nike was seeking was somewhat film Noire, with the high contrast, dark imagery. 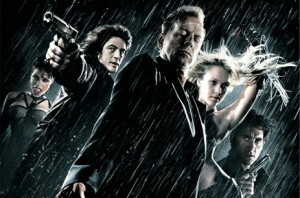 We pulled some reference images like the one to the left from the movie Sin City. Not the faces, but the black silhouette body forms. I sent some images like the image to the left to Nike to make sure we were on the right path. Next step was to create some sketches of the 2 scenes, so I started building some rough scene elements so that I could visualize the scale this stadium would play. The stadium was going to be an interesting challenge. Not only was a ball in the middle of a stadium an odd visual to me, but the ball inside an empty stadium was even worse! 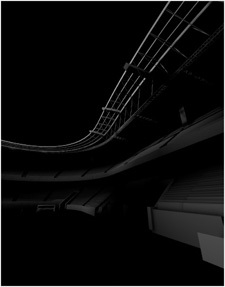 So the test for me was to create a composition which would show the stadium, but not the people. Ouch. I figured the dark scene with really bright field lights might somehow do the trick. I also started positioning some very basic 3d characters in poses/crops which worked well with the product + the stadium surroundings. I realized very quickly that Vray would not be an option for this rendering, as Vray does not have the ability to render out volumetric lights. The Stadium lights needed to be volumetric, which basically means they need to have some visible shape. Initial pre-renders ended up looking like those above. Using a photo I took of my office mate Jason (medical illustrator) kicking a soccer ball as well as some other reference images, Jason helped me to pose the characters as accurately as possible. I then positioned them within frame, and rim lit them a bit. 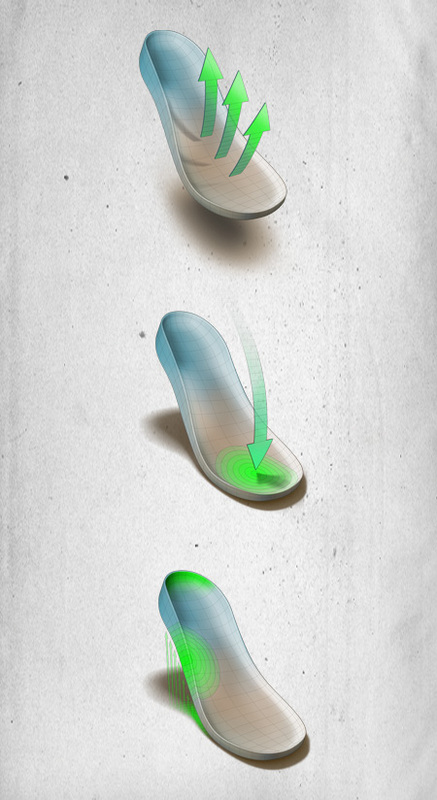 We then created some sketches that I used to get signoff on the concept from Nike. 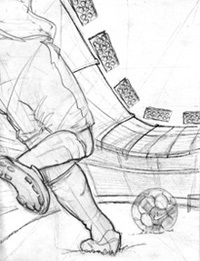 Shown here are round 1 and 2 of the soccer ball sketch. Nike thought that the ball in round 1 was much too small, so we had to come up with a knew composition. Once we had full signoff, I worked on rendering out the environment and the product, as Jason worked on the illustrating the final characters. Below are Jason’s final deliverables to me. They ended up brighter, and less contrasty than I had expected, but the scene’s would need some color, so I was happy with the result. 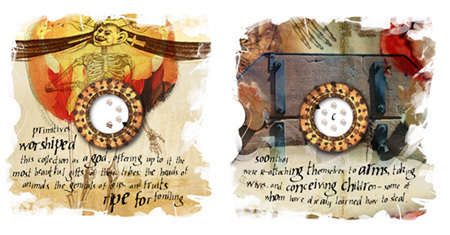 The final illustrations are shown below. 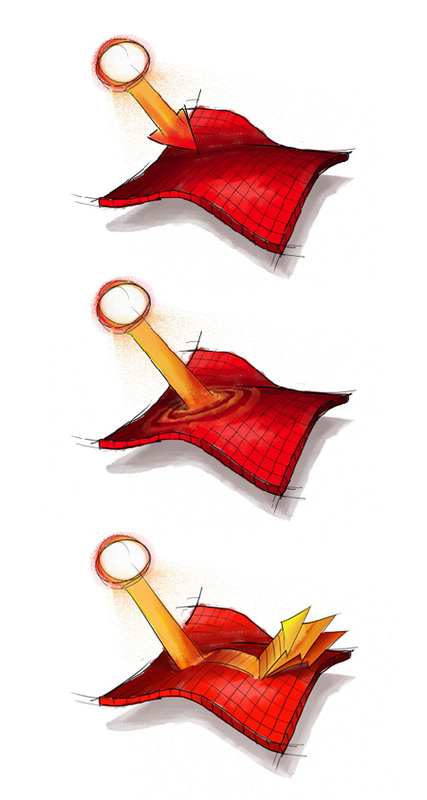 I think that the Ball illustration is the nicer of the 2 images. I did some fairly heavy post work on the images to get them where I wanted them. Lots of fake fog was painted in, grain was added, filters were applied in AE. Lastly, I did a lot of color correction and tweaking to get it all working together. The ball and grass were rendered within Vray, and the stadium was rendered with Cinema’s AR3. The cleat was also rendered in c4d. Note that the glove, although slated to be modeled and rendered, ended up being a photo I took in the studio. The ball we had modeled from a previous product, and we ran out of time to model and texture a full glove. My studio mate Jason Laramie was recently hired to create about a dozen illustrations which will be used to show off Columbia’s fabric and footwear technologies. 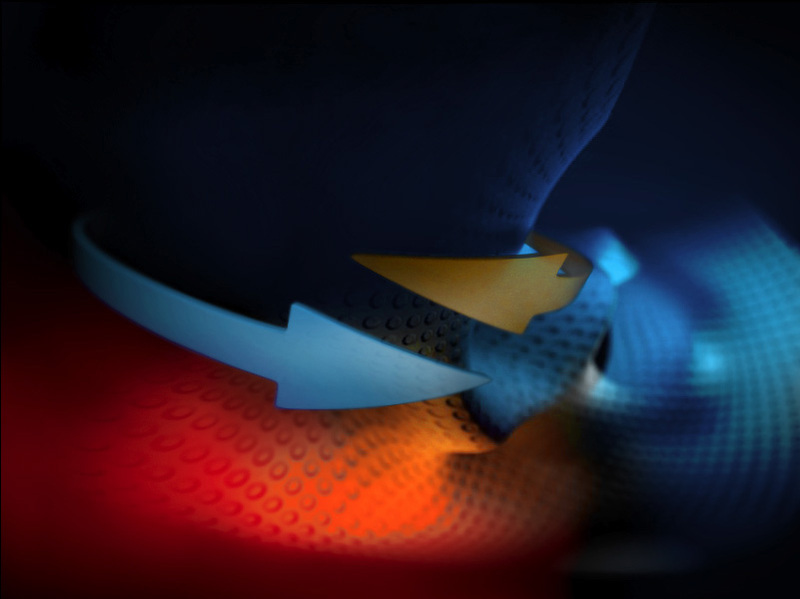 Omni-Tech is Columbia’s flagship fabric technology, which would compare to Gore Tex or Nike’s Storm Fit. All the other technologies would probably not be as recognizable to the general consumer. Jason, in his first meeting with Columbia, realized that many of the illustrations could benefit greatly from 3d, and he mentioned my name as a possible partner on the project, and they agreed it would be a good idea to utilize me in the process. Jason and I then sat down and brainstormed a bit regarding what we needed to do, and it was clear that the vast majority of the work should be done in 3d, with some post photoshop work as a final touch. Jason’s first job was to provide Columbia with some rough sketches of each illustration, and we agreed it would be good to get a comp in front of them of what a more final illustration would look like in style. We decided that the Omni-Tech illustration was the most important of the bunch, so we did some research on what Gore-Tex, Nike and all the other companies with similar technologies were doing for technology illustrations. Most were pretty similar. Big Giant created a series of hangtag illustrations for Nike several years back which were very nice yet they were a vastly different style from what Columbia was wanting. Final images look great. Will post once things become public. During my stint as senior AD at ZCom, I re-designed the corporate identity while the company was going through some major changes. On my first day as an employee, the company was purchased by Emerald Solutions, a giant interactive company which was on track to going public. So It was almost like starting a new job with 2 separate companies in the same day. Emerald was a technology company. An engineering company really. 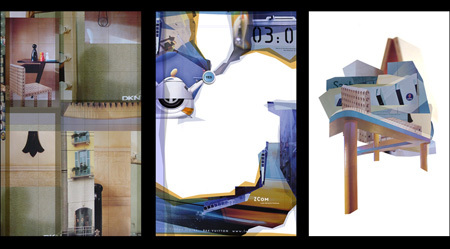 ZCom was a small, creative-driven web design firm. This created a number of problems, however the biggest for ZCom was the loss of our identity. As part of the acquisition, ZCom changed names to Emerald Interactive. This new name plus the fact that the .com bubble had begun to burst resulted in our work suddenly disappearing. It wasn’t even clear how to position ourselves any longer. So we decided to re-brand the company and to change our name back to ZCom, while still remaining under the Emerald umbrella. 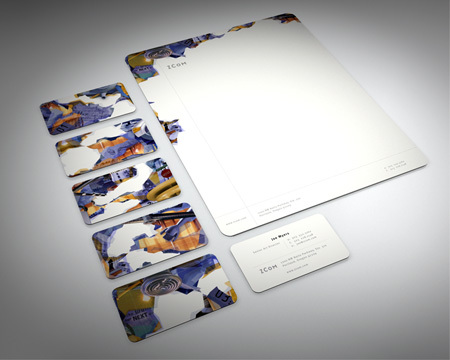 As part of the discovery phase on this project we identified several key visuals which were important to our brand. Some of these included our Portland location, our studio space, architecture, industrial design, some key words, and a somewhat edgy, non-corporate look and feel. Chris Miller our CD researched dozens of sites which we liked for one reason or another, and after discussing potential directions I produced 4 styleboards which we presented to the ZCom owners Dennis Hahn (now owner at ID branding) and Sharon Peterson. The decision was made to work from the board on the right, and while I started on the print collateral Elmer Bancud, one of the other AD’s worked on the website design. Chris made sure we both stayed on course and both the print collateral and the site turned out really really nice in the end. 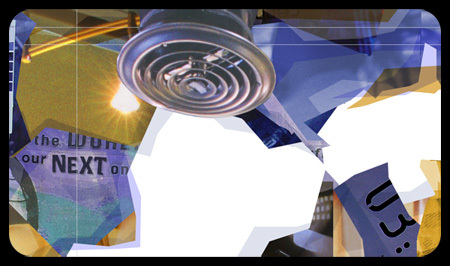 Here is one of many 3d renderings I created for Pop Art which were used by LP Corp. 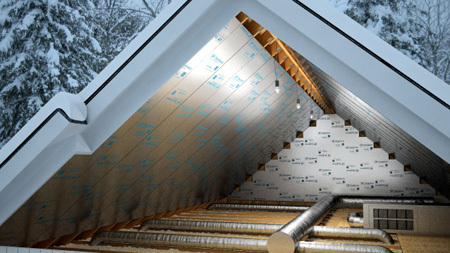 The idea here was to show a warm attic in the dead of winter due to the roll-on TechShield Product. I also created some 3d animations of the installation and use of this product. This was rendered with VRay. I was asked to create an illustration for Nike which depicted the company’s Sphere technology. As you can see in the image, Sphere fabric has just that, sphere shaped dimples, which act to pull moisture from your body. The direction I was given was to create an environment with the fabric, which should show a lot of depth and interest. Something else which was asked for was arrows going from the “cool” side of the fabric to the “hot” side. I personally didn’t want arrows, but I did what I could. Usage for this was an Ad as far as I know. Our Place Church asked me to create some branding for some community groups which were being formed. The naming was already completed, and the group names all had something to do with the outdoors for the most part. Our Place (OP) is a pretty progressive church with loud rock music, and even a fairly edgy idenity/logo. So I created several illustrations with an artistic brush stoke feel to them so that they would all have a cohesive feel. 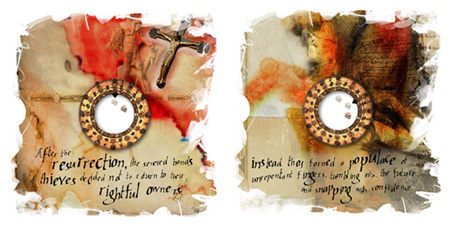 I then selected some bold colors, and made some small cards which folded in half for each group. 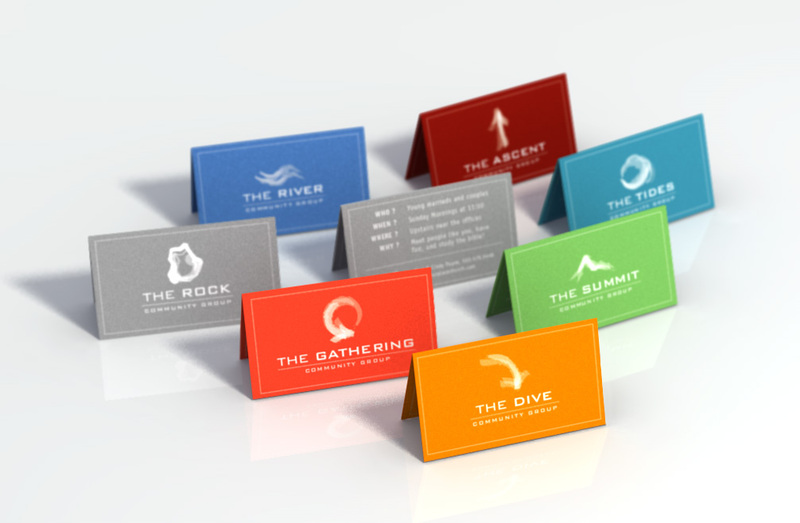 The one color cards were designed as “business” cards, as well as small table tents. Lastly I designed up some mock slides to be used in powerpoint so that each group could get their message to the congregation. 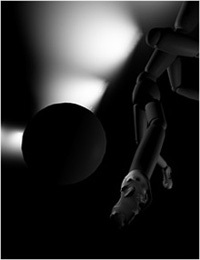 The image above is one of my first 3d renderings in cinema 4d.